It's been a while since I've had the chance to do reviews of these three series. Work just really piled up at the end of last year, and they all just came out at the same time. In an effort to make up for my lack of reviews at the end of the year, here are quick reviews of all three titles. 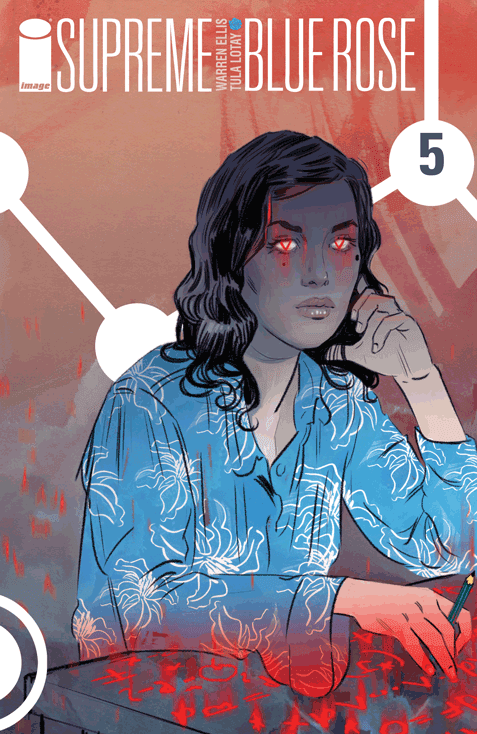 Supreme: Blue Rose #5 is rather full of exposition and explanations, but since the whole thing is ending with #7, this was the time to do it. After four issues of me saying, "It's pretty! I don't get all of it! ", different plot threads finally start to come together and paint a clearer picture of what's going on. What's more, stakes are heightened as our heroine Diana Dane finally faces true danger. There's still a lot we don't know, such as Darius Dax's true agenda, but it starts to really come together in issue #6, and the action really amps up too, with the various plot threads (even the Professor Night TV show) interweaving into the main storyline and explaining some oft he vague plot points. We know as much (if not more) than Diana Dane does, and Warren Ellis can be trusted at this point to pull it all together and deliver with the conclusion. 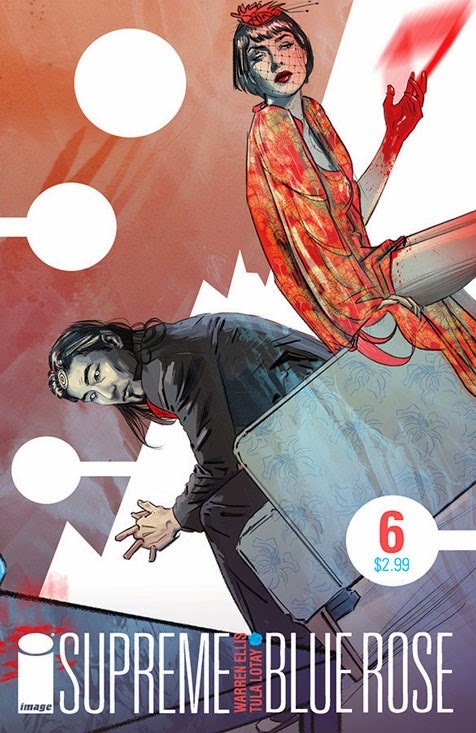 All the while, Tula Lotay's art is still beautiful, a true revelation in 2014. I'll miss this series when it's gone, and I look forward to getting the collection of Vertigo's Bodies when it's out, just to see her work. I can honestly say it's been a long time since I've felt that about an artist. 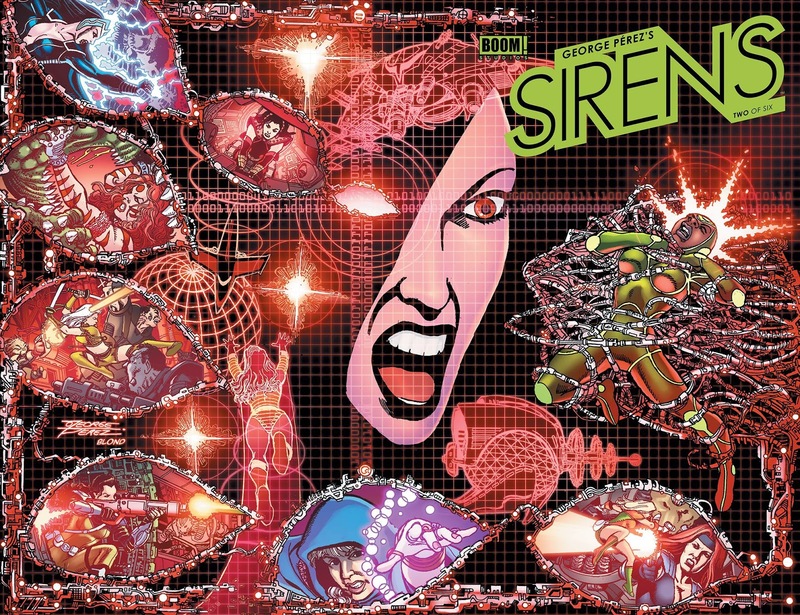 The second issue of George Perez's Sirens is an improvement over the first issue. The action is still fast-paced, and our heroines (each one based on a real-life cosplayer) come face to face with their arch-nemesis Naida. Some of the fun is tongue-in-cheek, although I can't help but feel that Perez would be crucified for doing some of these things if he were anyone else ("High heels totally inappropriate for combat... perfect! "), but I guess it helps that he loves cosplayers and cosplayers love him. (The lesson here, kids, is that it genuinely pays to be a good and considerate human being.) Perez the writer still is too ambitious for his own good, doing too many scene cuts to different eras and not really being, shall we say, deft enough to do it gracefully, but this is how he's written when left to his own devices, so it's not like I didn't know what I was getting into before I bought the issue. The coloring still bugs me, since it still looks pretty garish and the gradients don't really blend. I still liked it despite the overambitiousness of Perez the writer, the visible decline of Perez the artist, and the coloring, but Perez is my favorite creator of all time and I'll always be predisposed to enjoying something he does. From a living legend whose draftsmanship is visibly in decline (Perez went through eye surgery a while back), we go to one who seems to just be getting better. 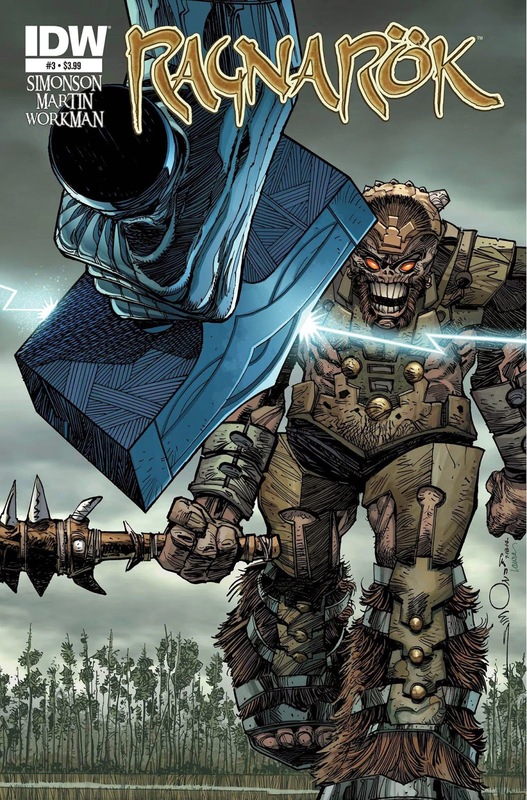 Walt Simonson's Ragnarok #3, from the start, already has two eye-catching covers. I think that one on the left (which is what I got) is just a perfect cover, with eye-catching concept and composition, and an expert use of colors by Laura Martin. But the second one's good, too, since it shows you that something big's about to go down. Both covers are actual scenes in the book, an old-school touch that, when done right, still works wonders in terms of, if not standing out at the racks (something less important as time goes by in the Previews age), at least amping me up for what I'm about to read. 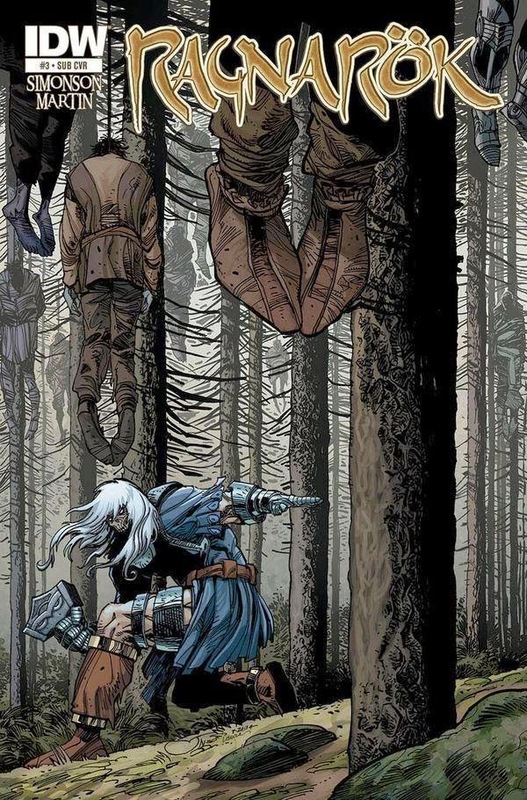 Starting immediately after the events of the previous issue, when Thor was awakened as a stone god with a missing jaw and kills all his would-be assassins, the Norse god of thunder and lightning sets forth to figure out what's been going on in his absence. It's not pretty, and he doesn't like the answer. What's more, he's still the same Thor he always was — reactive, ready to fight, and prone to anger, especially when innocents are threatened. What results is a momentum-driven, adrenaline-rising 20 pages, with Thor ready to fight anything and everything in his way. This isn't Marvel's Thor, the Thor created by Stan Lee and Jack Kirby (and before the "No one created Thor" crowd comes in, you know well enough to know that I mean this particular incarnation of Thor), so it's distinct enough from Walt's legendary Thor run, but it strikes me that Ragnarok has been paced kind of like Stan and Jack's old Thor run, in the sense that it just keeps going. The end of each issue is a cliffhanger because that's where Walt stopped drawing, not so much because he planned to end each issue there. Ragnarok doesn't stop moving. 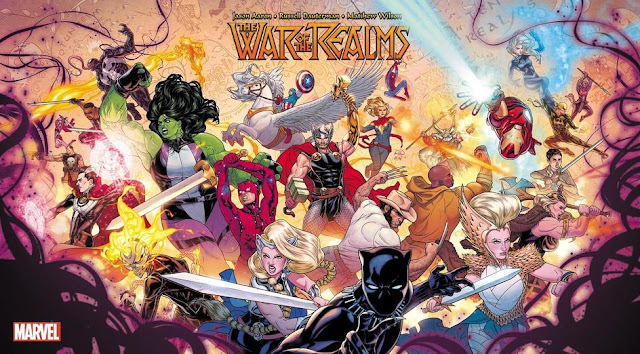 Action-packed comics at its finest, from a master who's only getting better.